Subject: M. crosses the city of Rome which is at present deserted and littered with garbage following the first signs of an epidemic;he is heading for the spiritual center of Zafer where personalities of the political and economic worlds, in close contact with the Catholic party which has the majority, have gathered to take part in a retreat. M. has broken the rules by coming with his wife.Behind the religious ritual, blackmail and power-games are taking place.A prominent person vanishes; consecrated hosts are stolen; a senator is riddled with bullets. A suspect is found dead in the toilets. 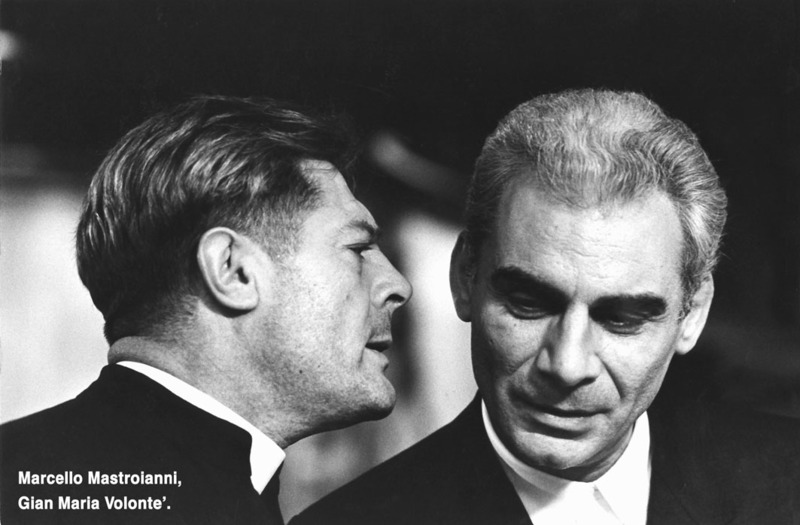 Then the director of the centre, the priest Don Gaetano, commits suicide.Al the guests leave the hotel. The last to leave is M. who comes across the corpses of the members.He realises the full extent of the plot, has his chauffeur arrested and, on his knees, awaits the shot that will put an end to his days. Cast: Gian Maria Volonte’(“M”), Marcello Mastroianni(Don Gaetano), Mariangela Melato(Giacinta,”M”’s wife), Michel Piccoli(“Lui”) Ciccio Ingrassia(Voltrano), Franco Citti(“M”’s driver) Renato Salvatori(Doctor Scalambrini), Cesare Gelli(Vice Prefecture Arras), Tino Scotti(the Chef), Adriano Amidei Migliano(Capra-Porfiri), Giancarlo Badessi(Ventre), Mario Bartoli, Luigi Uzzo(Lombo’s Brother), Loris Perera Lopez(Lombo’s Father), Nino Costa(the young Priest) Guerrino Crivello(Priest Speaking on the Tv Video), Marcello Di Falco(Sacca’)Giulio Donnini(Bastante), Aldo Farina(Restrero), Giuseppe Leone(Martellini), Renato Malavasi(Michelozzi), Riccardo Mangano(the Cardinal Beccaris), Piero Mazzinghi(Caprarozza), Lino Murolo(Mozio), Piero Nuti(Schiavo’), Riccardo Satta(Lomazzo), Luigi Zerbinati(Caudo).